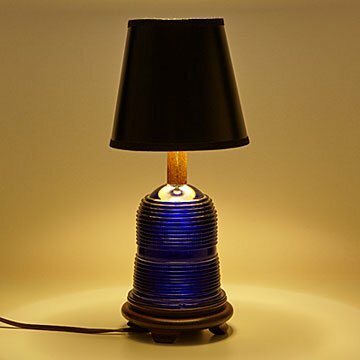 Tim Leefeldt turns aviation history artifacts, like these cobalt blue runway lights, into unique lamps. The vintage cobalt blue runway lights Tim Leefeldt turns into industrial-style lamps are authentic artifacts of aviation history—but they're also more than that. Guiding pilots as they flew people to career-making (or breaking) business meetings, far-away adventures, and family gatherings, each was a silent witness to some of the most memorable events in people's lives. Tim rescues them from forgotten retirement (and landfills) by adding electric lamp innards, a cherry wood base, and a black shade. The shade's reflective gold foil lining creates a beautiful glow on the blue glass when the lamp is switched on. Kind of like the nostalgic glow of the past, when seen from the present. Handmade in Chico, California. California native Tim Leefeldt loves transforming stranded, rustic pieces of America’s industrial past into useful modern products. He first made that connection in seventh grade. “My great grandfather was a railroad executive in Ogden, Utah,” he says. His grandmother invited Tim and his twin brother to travel there (by train, of course) for the centennial celebration of the “golden spike” that completed Transcontinental Railroad in 1869. Many years later, when Tim was a grown-up architect, he moved from San Francisco to Butte County, California, where he began hiking the rail lines criss-crossing the region. “I was amazed at all the industrial objects visible at any railroad crossing,” he says. He collected a few insulators to see if he could make them into light fixtures. Yep, he could. Now he assembles them in his Chico, California barn studio.